There is an old saying; “ When a tree falls in the forest and there is nobody around to hear it, does it make a noise?” I don’t know the philosophical answer to that question, but I just missed a great opportunity to run a practical test. Sadly sometime over the Winter we lost another of the four old guardians of our property in Welshfield. My wife likes to say of our home, “My husband bought some trees and a house came with them.” This is actually pretty true. 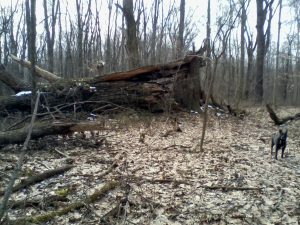 When I was shopping for a place to live after college, I told the realtor that I wanted as much wooded property as I could afford in my budget. When she asked about the house I said that I really didn’t care, as long as the property was nice. 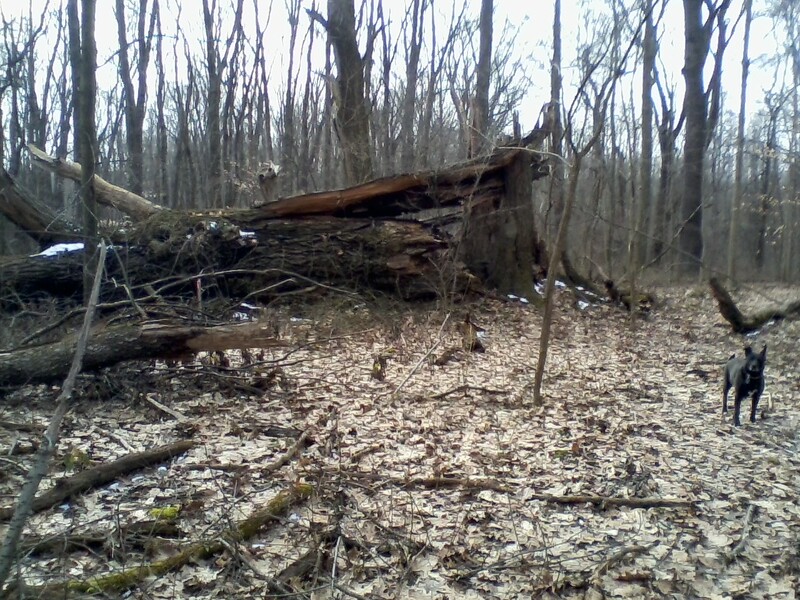 After a prolonged search, I got my woods, about 12 acres of it, with a house and an old farm field thrown in. The woods are a mix of an old overgrown orchard and an older woods with many big trees in it. They are mostly hardwoods with a few odd ones mixed in. Out of all these, four huge Red Oaks stood out, The smallest is right in front of the house, and is about 4 feet across. The other three were scattered in the woods and were a lot bigger. Being huge, mature trees, it was only a matter of time until they started to fail. 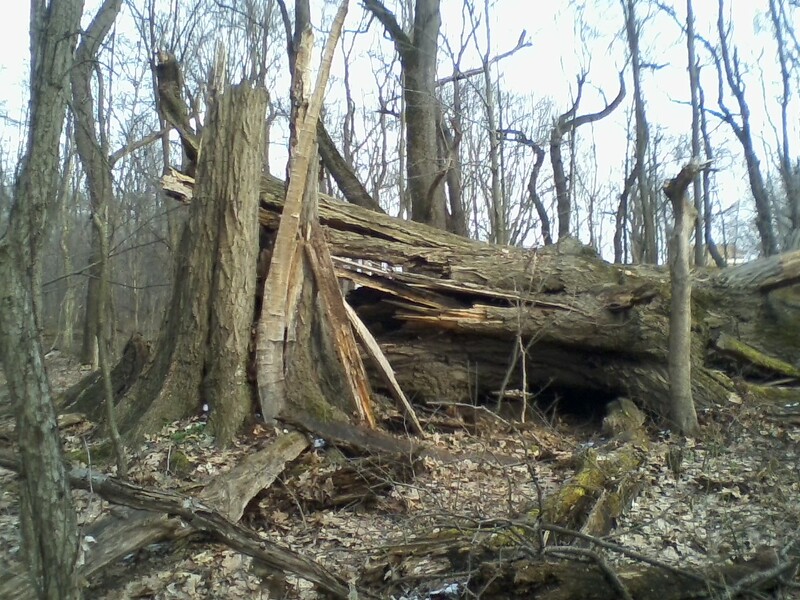 The big leaning one down by the creek let go about 10 years ago. 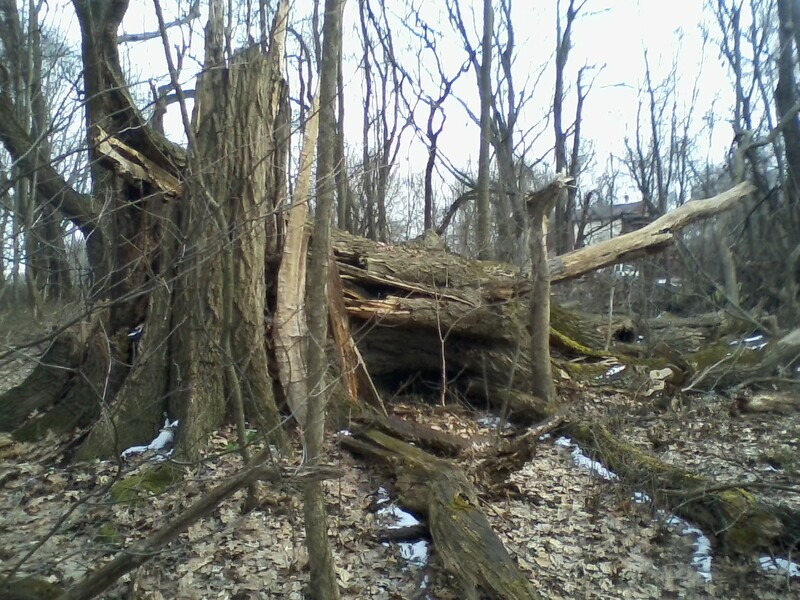 I can attest that when a tree that size falls and someone IS around to hear, it makes a hell of a noise. Mary Anne and I were at home at the time and in the middle of a quiet Summer night it finally broke in half and fell in the woods, taking several other trees with it. It sounded like the end of the world. The biggest one let go sometime over the Winter. 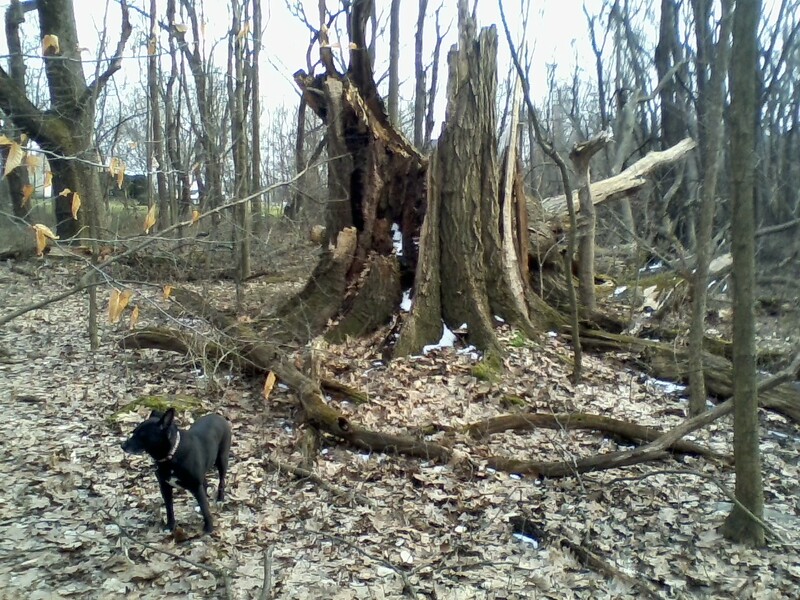 I was out walking with our dog Velvet last week and checking out the woods for the first time since last Fall. 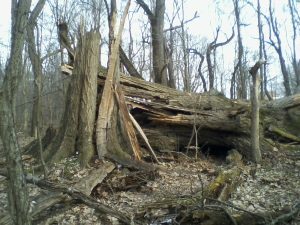 It was kind of sad when we got to the far end of our woods, where the towering giant had guarded our Southern property line. 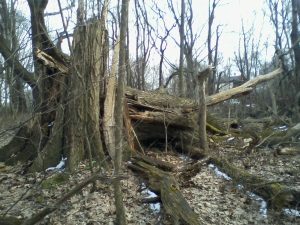 It was about 6 or 7 feet in diameter which an arborist website says would put it about 300 to 400 years old. It has been in decline since I moved there about 30 years ago. It has been loosing limbs as large as good sized trees themselves, but it just kept coming out in leaves every Spring, We would say, “Well, it made it another season.” But sometime this Winter a strong wind gust must have finally overcome the mostly hollow trunk and brought down the massive crown.